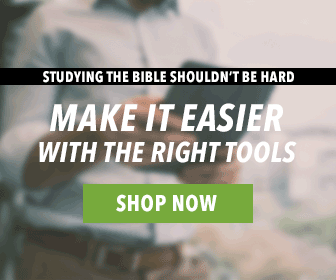 Here are 3 time management tips to help you be more efficient as you study the Bible. The Study Center has four tabs: Resource Guide, Parallel, Notes, and Lookup. Have you discovered how to take advantage of these tabs all at once? Use the Resource Guide as you normally do. 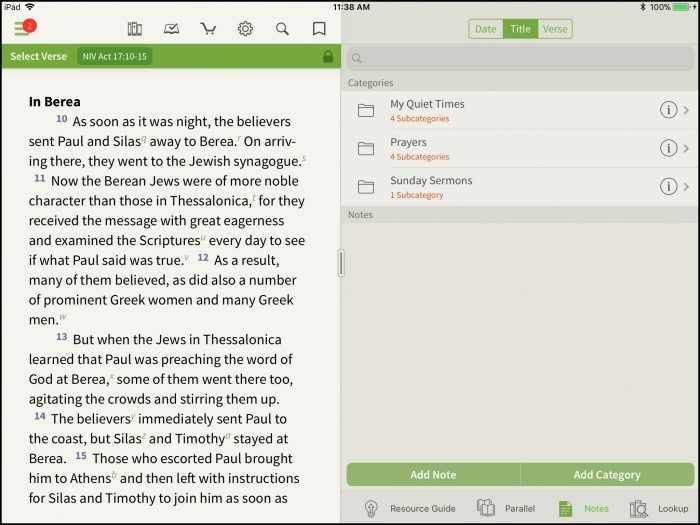 Use it to jump between commentaries, maps, outlines, and more. But, use the Parallel tab to keep that other resource you know you REALLY want to use open. It could be a commentary or study notes. 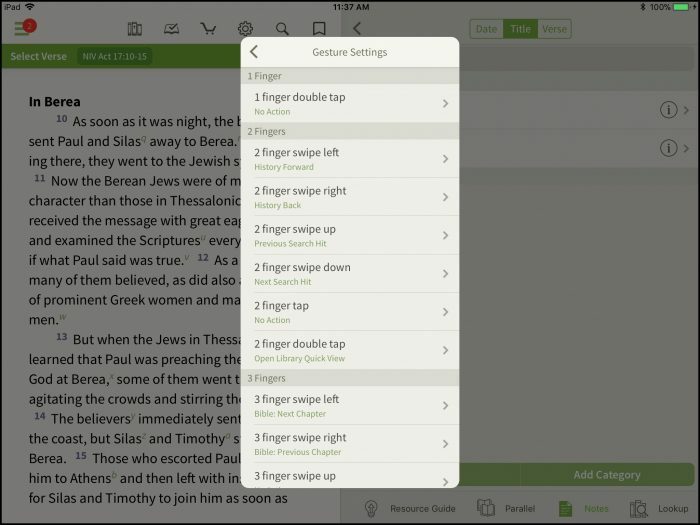 Or, you could use this tab the traditional way, keeping another translation available at all times. Then, open up a fresh note in the Notes tab and get to typing! You can quickly copy and paste what you find into a note to save for later. Also, you can search through your notes to remember what you learned in the past. Lastly, use Lookup to search for topics. You want to know more about Berea, so search for it! We’ll show you what information you have in your dictionaries and concordances. Can’t stress this tip enough: stay organized! You can create categories AND subcategories for your notes. For my personal study, I have folders for prayers, sermons, and quiet time. Inside these I separate types of prayers and if they are answered, different sermon series, and books of the Bible I’m reading. Not all of my notes are tagged within my Bible text, either. With your notes organized (with great titles and headers), then you should always be able to quickly search and find what you’re looking for. Remember when we used to flip through endless pages to find what we wrote three months ago? Never. Again. A fun setting I like to adjust inside my iOS apps are the gestures. Under Advanced Settings, you can select “Gestures/Shortcuts” to see all your options. Brainstorm your most common actions within the app and set them up to happen just a tap or swipe! these tips are really very helpful. 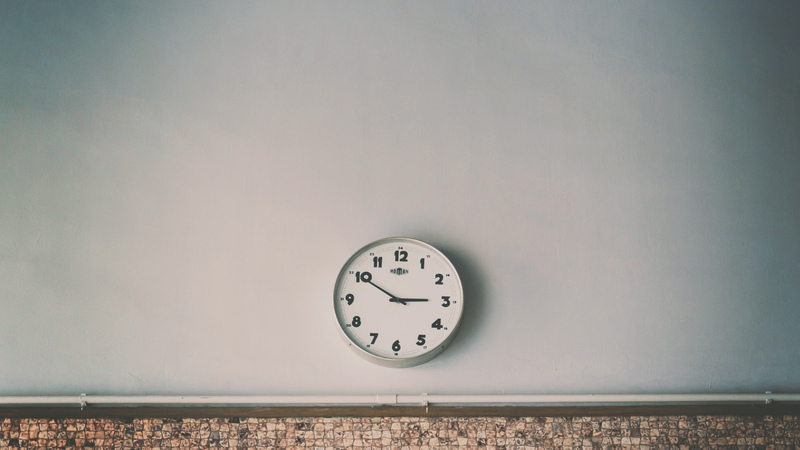 we must manage time properly for saving our times. because we know that time and tide wait for none.